Home to a 40 million year old catacomb of caves and limestone karst formations which protrude from the ground like ancient stone fingers, the Gunung Mulu National Park is truly a natural marvel. Located near Miri on the Malaysian island of Borneo, the park is a UNESCO World Heritage Site and a must for those seeking adventure and affinity with nature. 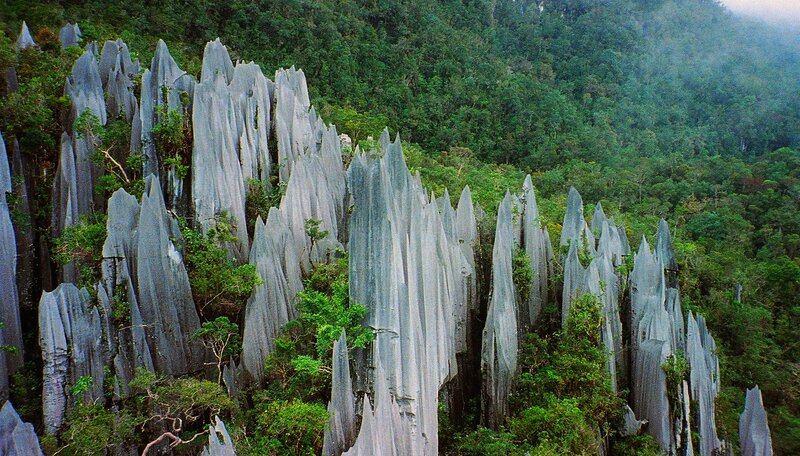 The park is surrounded by a particularly vibrant tropical rainforest, being home to 3,500 species of plant life and rests in the majestic shadow of the Gunung Mulu Mountain, a 2,377 metre sandstone peak; the Gunung Mulu National Park ‏is certainly dramatic. Caving expeditions are available under the instruction of expert guides and are a must in this exotic region. Deep inside the park, is the Sarawak Chamber, the world’s largest underground cavern – an immense black abyss home to millions of bats. This pulsating dark cloud swarms from the Sarawak Chamber of a night in search of (non-human) prey in a fascinating display of nature at its finest. Other highlights include Deer Cave, the biggest river passage in the world, where an ancient blue vein of water flows and contrasts to its perpetually static surroundings. Accommodation is available in the park itself and includes beautiful traditional cottages and longhouses with modern amenities such as Wi-Fi. For those seeking cheaper lodging, locals near the park offer homestays which are unpretentious and unique experiences. Gunung Mulu National Park is accessible on a 30 minute flight from the nearby Mulu Airport or via an express boat from Kuala.